I was sent a complimentary copy of this one by the author in return for an honest review – thank you very much! What should you do if you are an actress and your theater all of a sudden gets closed due to circumstances beyond your control? Basically everything that allows you to earn a bit. Derry O’Donnell has to dust off her Madam Tulip persona and, with her sidekick, Bruce, in tow, she goes to perform for the British aristocrats. An Earl is throwing an engagement party for his daughter and a psychic might be a good addition to planned entertainment. What can go wrong? Well, pretty much everything. There will be priceless paintings, old and new, Russian mafia, horses, and body parts of a very unhappy forger. There will be cards and a crystal ball and fortune-telling, with quite unexpected outcome. This one is, in my humble opinion, actually better than the first part, quite a feat per se because usually it’s the other way round. I even like the cover art better. It might be read as a stand-alone but if you are given an opportunity read the previous part first – it won’t hurt. At first glance you deal here with a well-known scheme: a filthy rich aristo is throwing a party because one of his daughters gets engaged. Plenty of people arrive, among them a psychic and an actress from the Emerald Isle, Derry O’Donnell and her driver, Bruce, the ex-SEAL. Then strange thing happen and poor Madam Tulip gets more entertainment than she would like to deal with. What can be done? She does a bit of sleuthing and decides to help poor aristocrats who, this time, might be neck-deep in serious trouble. Derry was such a sweetie in this one! I fully appreciated the fact that the author didn’t make her fall in love with anybody and still managed to create a very likeable heroine. The mystery behind an arm sent to the Earl was nicely done and quite believable. Still, even though the novel can be pigeonholed as cosy mystery or comic suspense, Mr Ahern was able to smuggle quite acute observations concerning e.g. the ambiguous feelings towards the Royalty and aristocrats and differences in mindset between Americans and British. I also appreciated the important role of paintings and curators in the plot! Making Derry go to the Salisbury Plain during the Mabon was like a cherry on top of a wedding cake! One more thing and I am done with my inordinate gushing. Two words: the parents. I cannot appreciate enough the fact that Derry is not another parentless ‘stub’ or an orphan girl. The dynamics between her, her American ma and Irish pa is simply priceless and so real! You might call it dysfunctional but it’s so funny to read about! Now my carping, thrown in just in case I go out of practice: the baddies. Sergiei shouldn’t have hit on Derry and if he already did it he should have followed that attraction. It would have made him far more interesting and the final showdown even more dramatic. One of funnier and cleverer cosy mystery series I’ve had a pleasure to read so far. If you ever stumble upon a Madam Tulip mystery do not hesitate to give it a go! You won’t regret it! This entry was posted in adventure, book review, contemporary, cozy mystery, crime, mystery and tagged comic murder mystery, cozy mystery, david ahern, funny heroine, madam tulip, series alert, that's how it should be done. Bookmark the permalink. It’s always a pleasure to clash with you :). 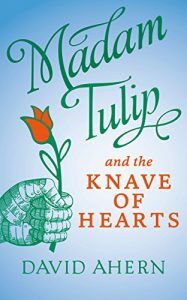 Pingback: Madam Tulip and the Knave of Hearts is “funnier and cleverer” says Anachronist (portiabridget) | Madam Tulip mystery thrillers!